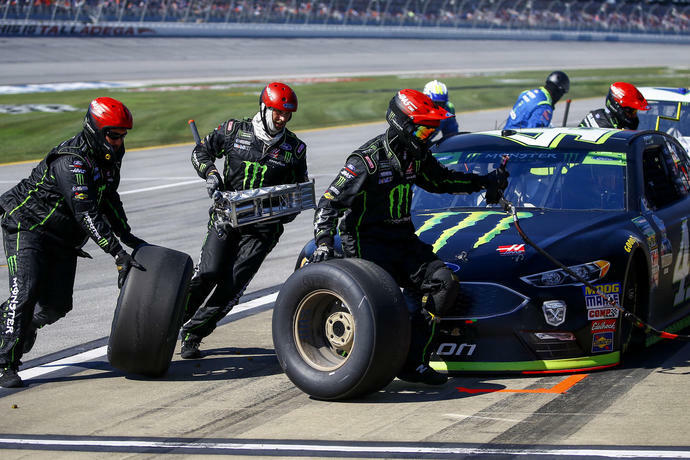 TALLADEGA, Ala. (AP) -- Kurt Busch is not the most sympathetic figure. When he loses a race he was one turn away from winning because he ran out of gas, few likely felt sorry for him. Then came his post-race assessment in which he criticized NASCAR for blowing two calls that led to him being short on fuel. Because the complaints came from Busch, a polarizing driver with past bad behavior, he didn't get the condolences he felt he deserved. 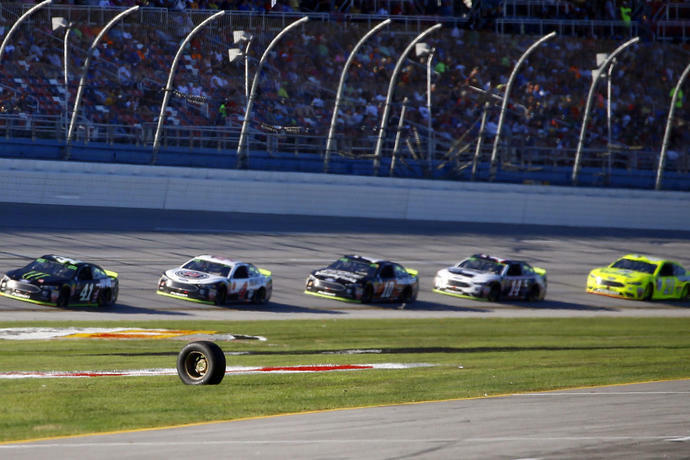 There are conspiracy theorists who believe NASCAR officiated the end of Sunday's race at Talladega Superspeedway in a way that put Busch in position to lose. Of course, the scoring tower could not guarantee that Busch would run out of fuel while leading through the final turn in overtime, but his criticism deserves a look. Busch led a race-high 108 laps as the strongest car in the Stewart-Haas Racing lineup. He led his three other teammates all day as the SHR group had the field covered. The four SHR Fords had a healthy lead on the competition when Alex Bowman brought out the caution that sent the race into overtime. The SHR cars were already conserving fuel, and those additional laps drained their gas tanks to nearly bone dry. Why? Well, NASCAR didn't red-flag the race after Bowman's crash and instead ran five laps under the yellow flag. That's 13.3 extra miles around Talladega with fuel lights flickering. Just one fewer lap under caution and Busch doesn't run out of gas - and likely wins the race. Instead, he led the field to green in overtime - an additional two more laps around the 2.66-mile track - as teammate Kevin Harvick forfeited the gamble and ducked to pit road for gas. Like many, Busch wondered why so many caution laps and why the race wasn't stopped for a cleanup. Then came another accident, while he was still leading in overtime, and NASCAR did not call a caution. Had the yellow been called on that final lap, Busch probably would have won the race. Instead, he was still hard on the gas for the final 2 miles and his tank finally went dry with the checkered flag in sight. SHR teammate Aric Almirola slid past Busch's sputtering car for the win. Busch also blasted the decision not to call a caution for the final accident. ''There was two cars dead in the water,'' Busch said of NASCAR's need to call a caution and send a medical crew to the disabled vehicles. Busch left Talladega with a 14th-place finish. A victory would have put him into the third round of the playoffs, but that berth instead went to Almirola. NASCAR, meanwhile, waited until Monday to address Busch's criticism and Steve O'Donnell was adamant the sanctioning body was correct in its officiating. The head of NASCAR competition said the race was nothing at all like the Truck Series event a day earlier, when that event ended under caution because of a late accident. In other words, because the accident Sunday was behind the leaders, NASCAR preferred to let the drivers race to the finish under green. But that's a judgment call and one that cost Busch, an unpopular driver with NASCAR brass, an important victory. While every race is different, officiating should be as close to black and white as possible and NASCAR should never open itself to the idea it intentionally tried to prevent a driver from winning. And once the implication was made, it should not have taken a day for NASCAR to address it. The Truck Series race the day before wasn't NASCAR's finest moment, either. For at least 15 minutes after the race, the pylon, timing and scoring, and NASCAR's official web site all listed Wendell Chavous as the winner. But Chavous was actually fifth and Timothy Peters was the race winner. Chavous thought he won until he learned all the statistics were incorrect, and NASCAR simply moved on to the next race as if nothing bizarre had happened. NASCAR has got to tighten up in every area, particularly accountability. There are five races left in what's been a trying NASCAR season. Improvement needs to start at the very top. There's just one question you have to ask yourself this week: "Do I feel lucky?" Even if you don't, you still have to get through the Geico 500. There are 40 cars entered for the Cup race and 37 entered for the Xfinity race. The NBC Sports writers also discuss what they're looking for in the next month and if Cup drivers should be further restricted from Xfinity races.